Please refer to our stock # ha1 when inquiring. 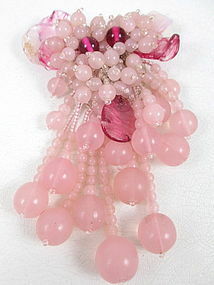 This lovely vintage dress clip was designed by Frank Hess for Miriam Haskell in the 1930's. It measures 4" long x 2 1/2" wide and has a celluloid backing with metal dress clip mechanism. The front is intricately embellished with imported pink glass beads and lamp work glass leaves. It is not signed like all early Miriam Haskell pieces, and it is in very good condition.